In 2019, organizers are changing up the format to help connect residents with emergency resources. Regular attendees of Forest Grove's annual town meeting are used to filing into the Forest Grove Community Auditorium, sitting down, and listening to city leaders and other officials speak for an hour or more. In past years, town meetings have covered such topics as unifying western Washington County's separately organized fire districts or preserving Forest Grove's status as a full-service city. But next Saturday, Jan. 26, all of that is going out the window. This year, organizers of the town meeting are presenting it in a different format. Instead of sitting for one long presentation, attendees will be able to browse from display to display, visiting booths and learning about how to prepare themselves and their family in case of emergency. City Manager Jesse VanderZanden will deliver some opening remarks at 9:30 a.m. Otherwise, this year's town meeting will be a largely self-guided experience. The venue of the meeting is changing as well; it will be held this year at Forest Grove High School, in the auditorium and likely spilling out into the hallway outside. "We have felt for the last couple years that we've outgrown the space," said Devon Downeysmith, a member of the Forest Grove Committee for Community Involvement, which plans the town meeting. "We've been full or over capacity in the city auditorium, and we really want to make it so that more people can come. We wanted to be cognizant of having a space either for childcare or having some sort of format where people could bring their kids and not really feel like that was going to be a nuisance." The committee's role in putting this meeting on was different from past years as well, Downeysmith said. "I think for the past two years, the city staff or council has kind of told us what the topic will be, and then we have planned the logistics and really provided support for something that the city specifically had an agenda around," Downeysmith said. "This year, there didn't really seem to be a mandate from City Council or staff. It was just kind of up to us to decide." The open format that the committee settled on will be more of an "information fair" than it has been in the past, according to Bryan Pohl, Forest Grove's community development director. "People will be allowed to just kind of mill about, visit the booths, ask questions," Pohl said. He added, "The participation is really up to the individual who comes. … There's no sort of required stay to get the information that you want." Materials will be available in both English and Spanish, Downeysmith said. Bilingual volunteers will also be on hand. Exhibitors lined up for the Jan. 26 event include Forest Grove's police, fire and public works agencies, Washington County Emergency Management, NW Natural, the American Red Cross and others. "I think it'll be a really good opportunity for people to learn a lot," Pohl said. Both Downeysmith and Pohl highlighted one exhibitor as being of particular interest: the Map Your Neighborhood program, which provides the tools for residents to build an emergency plan based on the people, places and things around them. 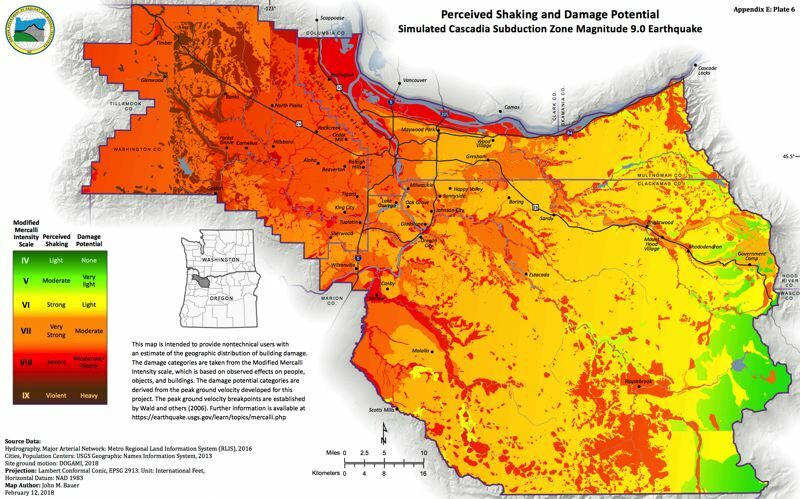 In a situation like the dreaded Cascadia earthquake — the so-called "Big One" that last struck the Pacific Northwest in 1700, and which some experts say has as high as a 40 percent chance of recurring within the next 50 years — Map Your Neighborhood could be a lifesaver. Knowing who in your apartment block or subdivision is a medical professional, where the natural gas lines are buried, and which households have elderly people or young children, among other information, might be critical when major roads and bridges are impassable, first responders are overwhelmed, and the power, internet and maybe even cell service are all out for an extended period. "It's a really good exercise to go through with your neighbors and learn where the resources are," Pohl said. Downeysmith acknowledged that disaster planning can often feel overwhelming, and many people don't know where to start. She is hoping that many Forest Grove residents will take the first step by dropping by Forest Grove High School on the morning of Jan. 26. "Obviously, I think we want people to come away from it feeling like they can come up with a game plan for their family for emergency preparedness, rather than feeling like it's this thing that they need to do and they don't know how to get started," Downeysmith said. "But I think a secondary goal that really plays into CCI as a committee is we want to create a closer-knit community." The town meeting is scheduled to run from 9 a.m. to noon. Attendees can enjoy a free light breakfast. The program is family-friendly.